Smile Solutions by Dr. Joe Fox is a Hendersonville and Goodlettsville dentistry practice located at 3050 Business Park Circle, Ste. 202. Dr. Fox opened his practice in 1990 and has been a part of the local community ever since. Our office features an inviting reception area, windows in many of our treatment rooms, and televisions with headphones and DVD players for your entertainment and comfort during your visit. We also use digital X-rays and digital intra-oral cameras. In addition to offering the benefits of less radiation exposure, digital X-rays provide instant images that we can project onto a screen for you to view. Intra-oral photographs help us explain your treatment options and our recommendations. We have found that this technology enables our patients to play a more interactive role in understanding and planning their care. Our staff is a team of experienced, educated, and caring professionals who enjoy their work and endeavor to make each dental visit pleasant for every patient. We offer extended office hours during the week to make it convenient for you to fit dental appointments into your busy schedule. Office hours are Monday, Tuesday, and Thursday, 8 a.m. to 5 p.m.; Wednesday, 11 a.m. to 7 p.m. 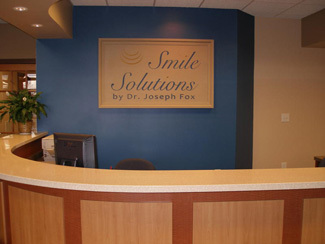 If you would like to schedule an appointment, please call our office: (615) 859-3700 or email: joefoxdds@yahoo.com.